Vining Marine Ltd are strong supporters of our local boating Clubs. A considerable number of our Marine Brokers have given freely of their time to the various Boating Clubs in Marlborough and Nelson, we have held Commodore and Flag Officer roles and generally enjoyed putting something back into the sport we love. At least three of our team (Ian, Mike and Rob) compete in yacht racing on a weekly basis during the season and we have been lucky enough to win the odd series here and there. The Waikawa Boating Club caters to both Yacht and Launch owners with it's 20 moorings in the best bays/coves around Queen Charlotte Sound and 4 more in Tory Channel making over-nighting anchoring safe and easy. The Club has reciprocal rights to use further moorings in Pelorus Sound and D'Urville Island that make longer trips possible for their members. The Club puts on an extensive yacht racing programme throughout the year with its Tuesday night twilight racing attracting flights of between 40 and 60 boats every Tuesday night from late September through until the end of daylight saving each summer. The Pelorus Boating Club caters to both Yacht and Launch owners and has over 30 moorings around Kenepuru and Pelorus Sounds as well as D'Urville Island. The Tasman Bay Cruising Club is a very active Club both socially and on the water. The Club House is well located and popular with its members. The Club has a full racing programme. 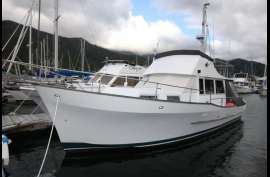 The Club has a number of moorings in Croiselles Harbour, D'Urville Island, Port Ligar, and Pelorus and Kenepuru Sounds. The Queen Charlotte Yacht Club hosts dinghy sailing every weekend over the summer. Classes on the water include Opti's, P Class, Splash etc etc. The Club hosts many regattas during its season and has a dedicated band of volunteers who help put it all together season after season. Mana Cruising Club Inc. Formed in 1959 by a group of dedicated boaties, the Mana Cruising Club’s goal of developing a friendly, family based club, while fostering safe boating continues.